Nestled in the northeast section of the community, about 10 blocks from the beach, lies WaterColor’s notorious Camp District, home of Camp WaterColor making this area the perfect choice for families with children. 3 bed, 4 bath Watercolor home with fabulous outdoor space. Check availability and book online with 360 Blue today! This large non-smoking custom-designed home is beautifully decorated and an awesome family retreat! Located in the Camp District, this three bedroom cottage is perfect for your next getaway. 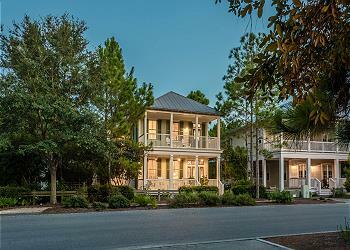 "La Belle Maison" is a lovely 4 bedroom/ 4 bathroom home in WaterColor's Camp District. Families will enjoy relaxing on the large cozy porches and the convenience of being steps away from Camp WaterColor. 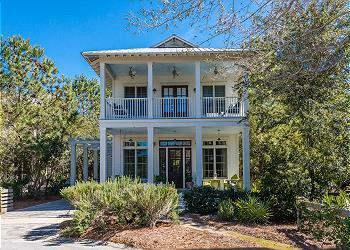 425 West Lake Forest is a charming 4 bedroom home located in the Camp District of WaterColor. This fabulous abode features a reverse floor plan, pine hardwood floors, and first and second floor wrap around porches! Just steps away from Camp WaterColor, 1322 Western Lake Drive is a fabulous 4 bedroom home perfect for any family to enjoy! Stunning 3 bedroom/3 bathroom Cottage centrally located on the Camp District, just 3 minutes walking distance to the Camp Pool. Recently remodeled, this house offers the latest appliances, hardwood floors, granite counter tops and natural gas stove. 152 Red Cedar Way is an impressive home with two master bedrooms, a private pool and massive outdoor space! This 4 bedroom 4 bath home is located in the popular Camp District with Camp WaterColor and Wood Fern Park just steps away. Being a wonderful family home featuring an exceptional open first floor plan backs up to the pond at Wood Fern Park. 54 Thicket Circle is a professionally decorated home featuring 4 bedrooms, 4 bathrooms and accommodations for 8 comfortably. Enjoy the convenience of being across from Camp WaterColor and just a block away from Publix. 152 Pond Cypress Way is located in the popular Camp District in WaterColor, with lush greenery and long needle pines, making this a peaceful vacation location! Spend your next beach getaway at "Lingerlonger." This 4 bedroom/ 4.5 bathroom home offers an open floor plan with plenty of space for the entire family! 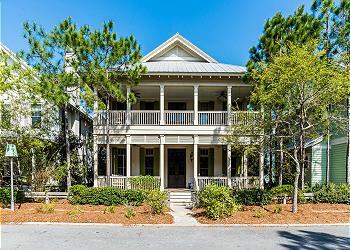 188 Spartina Circle is a beautiful home in the Camp District of Watercolor. 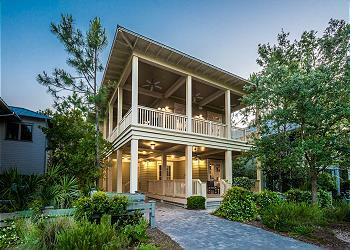 This home features two large porches in the front and back of the home. A watercolor portrait where we won't need to paint you a picture! 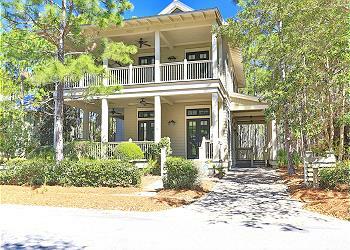 Spend your next WaterColor getaway at "Gather Together", an open-concept, 4 bedroom home in Watercolor's Camp District! Relax in the heated splash pool or hang out on the fourth floor viewing tower for even more fun! 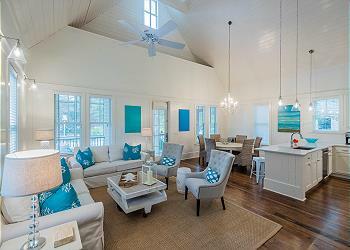 Spectacular beach cottage with highest quality design, features a bright and open floor plan. 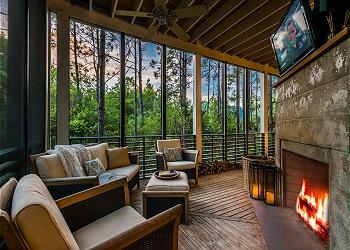 Multiple outdoor porches, included one screened and another with fireplace. Located short distance to park and community pool! 178 Spartina Circle is a centrally-located three bedroom home with has two stories that overlook the entrance of Camp WaterColor. Beautiful 4 bedroom camp district home. Backs up to park for privacy. 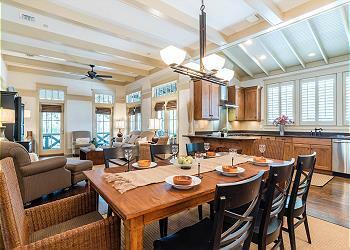 Open concept kitchen, living and dining room. 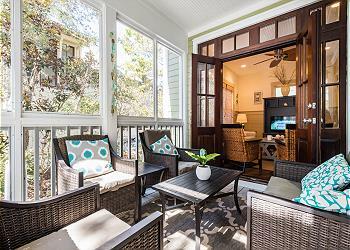 Spacious back porch with ample seating and entertaining space. 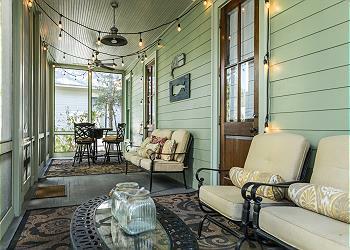 "Blue Haven Cottage" is a charming four bedroom cottage in the Camp District of WaterColor. 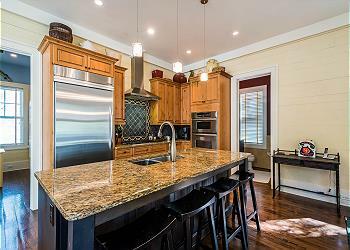 Recently updated with beautiful designer finishes! Enjoy it's serene environment and location to nearby WaterColor amenities! 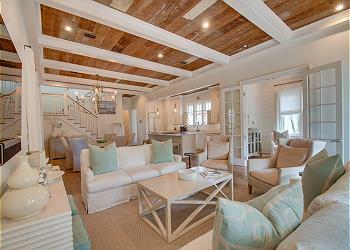 This is coastal living at its finest.